I really do try and cook proper classic traditional recipes whether French, Italian, Spanish or British. Some of these are really good comfort foods too, but there are also those variations that we make up or someone gives us a recipe and they become a firm favourite with the family. These are usually the weekday meals as I try and do something more traditional at weekends when I have more time. This recipe came to me from a friend, well he never actually gave me the recipe but he did cook this for us a couple of times and it was a hit especially after a few bottles of wine. Mind you we were usually half corked by the time we ate as he used to chop the chicken with a knife as he didn’t have a kitchen machine! You can use chicken or turkey for this. I have used both and they are both good but turkey tends to be a bit meatier. 500g brocolli, florets cut from the stalk. Bring a pot of water to the boil and blanch the brocolli florets for about 6-8 minutes as you don’t want to over cook them. Heat olive oil in a pan over medium heat and add the onion and garlic, fry until soft then add the Minced chicken or turkey. When the meat is browned season with salt and pepper, you can also use a bit of chilli if you wanna spice it up a notch, then add the cream or crème fraîche give it a good stir in then add the brocolli florets and stir in a bit more. Remove the mixture to a suitable sized casserole and put to one side. In a saucepan melt the butter then add the flour and keep stirring until it forms a runny paste then slowly add the milk. Some people like to heat up the milk first but why dirty another pot! When the suace startes to thicken season with the salt and nutmeg and stir the mustard powder. If you don’t have mustard powder a good teaspoon of mustard will work. 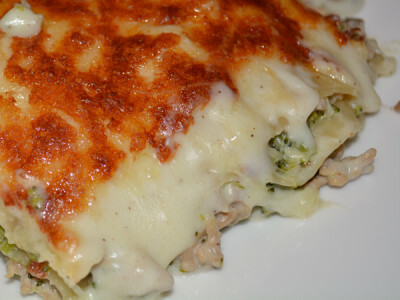 Once the sauce has thicked pour over the meat and brocolli mix in the casserole and then grate the cheese on top and bake in a medium oven around 180°c until the cheese on top is a nice golden and brown colour. Take out the oven and leave to settle for about 10 minutes or so. Tip: If the bechemel doesn’t thicken enough put a heaped tsp of corn starch in a cup and mix with a bit of milk then stir into the sauce or yu can always add extra cheese to the sauce to thicken it.